Article: TRP Podcast 66: Draft, War of Light, and YOU! Thread: Article: TRP Podcast 66: Draft, War of Light, and YOU! You can view the page at http://www.thereservepool.com/conten...Light-and-YOU! Is there a card list with what is in the whole set? I have only seen the spoilers thread. http://dm.retrobox.eu/ has everything, and our Wiki is in the process (Card Database). @Dave can you elaborate more on the "walling up" that you are advising to not do. I'd hate to see newer players avoid using defensive tools and strategies, because you said not to build a wall. for example, here is how I pilot my draft teams 90% of the time. 1- I do not field early turn character purchases (of course there are exceptions), but instead use them as energy to make other purchases. 3- use my life as a resource. because of step 1 and 2, I don't have any blockers except sidekicks. I'm ok with that. 4- Once I've bought almost all of desired pieces, start fielding everything. build a wall to stop the bleeding! 6- Play board control = I'm constantly manipulating character counts on both sides, and calculating when and how I'll get that lethal swing in. 7- swing for lethal! last week, I was losing 1-20 when I swing with 21 for the win. A. so is this the walling up that you are referring to? B. does your "don't build a wall" statement apply to WoL as much as it does other sets? specifically JuL. C. is your "don't build a wall" statement heavily weighted by the fact that matches are timed? D. do you feel the same for un-timed matches? Last edited by SarkhanMad; 09-17-2015 at 02:03 PM. Players should not blindly pick uncommon Fatality first. Due to the utter lack of ramp in this set, the odds of rolling her character face, energy to field, and still have three extra bolts are not amazing. Don't get me wrong. She's amazing. I won my release draft last night with her. But I went all in on bolts, had four fatality dice, and I still only got her to trigger half the time. Certainly a top draft card, but not singularly so and I wouldn't consider anyone dumb for not picking her if their second pack and the dice in the table didn't support it. A. I'm not sure from your description. I'm referring to teams that don't prioritize inevitability. In draft, which is almost always a slower format than constructed with fewer direct counters (and fewer opportunities to GET direct counters) whoever has more direct damage puts the game on a clock. If you don't have the tools to keep pace or get ahead of that then you will quite simply lose. The player who is getting 2-4 easy damage per turn is going to win over the player that can't, and it won't take them long to do so. B. It applies to pretty much every set. Especially JUL, where you saw people building up firmly entrenched defensive positions that fell repeatedly to Firestorms and Cheetahs while having a 50/50 shot in matches that featured no direct damage. A working Ultron/Drone will kill quickly, especially if Hulk Out is brought in. A common Fatality could easily do 3 damage every time that she's fielded. So could the uncommon. And that's the usual story. A team that walls will be sub-50% win rate against a team that can establish inevitability and will be a coin-flip against another wall team. A team that can get up and over walls with direct damage/unblockables is generally +50% against walls of dice, and fairly even against a similarly oriented team. I'm not saying you can't win using traditional combat with some removal and combat tricks, but it's much harder to draft and pilot such a team, and even an ideally structured team isn't always able to deal with faster teams. In this game speed generally equals efficiency, and that's more important in a resource management-oriented game like Dice Masters than it would be in something like Magic. C. Partially, yes. Mostly because it doesn't set you up to have a good time due to the above. Unless one is purely there for the camaraderie and cards, which is perfectly valid. D. If you're holding up other players, absolutely. So many bolts here though. And most are pretty solid. I would say that the common is an excellent choice as well. The other side to it is that she's probably not a card that you want to pass. I'd say it's twofold - A) She might be an integral part of your team; B) If you pass her, she might beat you. If I had the C and the UC in the pack, in this format, I'm probably taking the C. But if I had just the UC, it's hard to imagine what I'd take above her at the Common or Uncommon level. I like this response. I wish it wasn't true, because that is exactly the way I want to play the game. But it is true, and a great explanation of why walling up loses you games. I still think that Gobby/HT/JuL/etc. has warped everyone's card evaluation thought process. direct damage is the first thing people look for, and there's definitely proof of its effectiveness, but I wonder if we are lost? Also, I don't consider previous description of how I prefer to pilot my teams as walling up. It's not a defensive wall, it's an attacking front line! I think that in draft, control-oriented strategies lack the win conditions and the counters to the direct damage that they have in constructed. Also, consider that even in constructed, control deals with direct damage via loss of life (Jinzo, etc). yes. it's weird for me. because when I played magic, I leaned heavily towards direct damage and never played control. But in dice masters, I have no interest in playing anything that deals damage directly to the opponent, and am really into character control (both removal and blocking control). So I was really disappointed when the first DC set had so much direct damage, because I prefer it over marvel. I'm really excited about drafting this set. I think there are a lot of possibilities. A lot of good, cheap characters and some great abilities. What I like most about this set is the definite lack of direct damage. It's going to open up other styles and approaches. I should be receiving my gravity feed this coming Tuesday, Sept. 22nd 2015. I'd like to record my unboxing and share with you guys. How can I get that to you? So I played a rainbow draft game and won 2nd place to receive the two bat mobile - from Wayne enterprises variants, an aquaman Arthur curry, and a robin boy wonder. But my go to cameraman was a no show and couldn't get a hold of him. So I'll just say my favorite pulls from my gravity feed. Raven - Azarath, Metrion, Zinthos! I pulled other Rares and all the common and uncommon (I don't know if all gravity feeds are like this with all common and uncommon) which is why I only named Rares. All in all, this was a good pull and although one of the packs only had one die in it, I still had plenty others to give me the minimum four for that character. 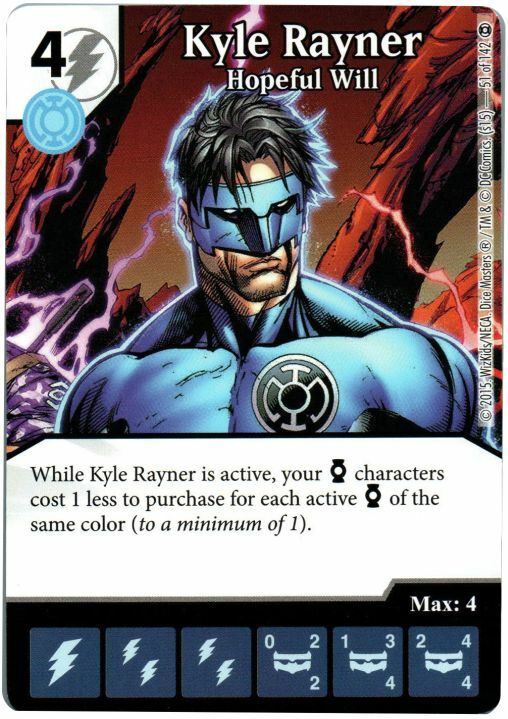 Listening to your podcast definitely gave me some great insight into the rainbow draft game (my first one btw) and I'm sure I had a winning draft if it weren't for that rare lantern ring and the other player having 3 uncommon Carol Ferris dice and distraction I had a good chance at beating him. Just want to thank you guys and tell you to keep up the good work and hopefully I'll see you in a draft game soon. I disagree about first pick on Fatality and Wonder Woman. Fatality came up in draft and the player never used it because the lack of 2 bolt cost characters besides Miri Riam. The thought on rolling for 3 bolts is a waste of time. Considering how slow this set is, deduction universally (board wise) just for you is the best pick.